If you’ve recently acquired a Smith & Wesson K-frame, or you’re just on the lookout for a new holster, this review will help guide you through some of the top choices on today’s market. You may feel put off by the sheer volume of holsters to choose from, but don’t worry, we’ve done the homework and come up with what we consider to be the best K-frame holster. Our top pick is the Bianchi 7000 Black Sporting Holster, it’s a great looking holster with a range of quality features at a price that won’t empty your wallet. Read on to find out more of those features. The letter “K” is Smith & Wesson’s designation for their medium-sized revolver frames. To get a feel for the popularity of this class of firearm, the classic S&W Model 10 – which is built on the K-frame – is the largest-selling revolver in history ever since it was first manufactured in 1899. Semi-automatics may be all the rage now, but wheel guns like the K-frame series were a firm and reliable favorite among law enforcement officers throughout the 20th century, and they are still being made today. If you’re interested in reading more about the K-frame, this article is well worth checking out. Smith & Wesson have produced a bunch of different K-frame models over the years. The most common barrel length, and the one you were most likely to see police using, is a 4-inch barrel. They’re also available with a longer 6-inch barrel, and with a 3-inch, 2.5-inch, or a 2-inch snub-nosed barrel. Simply because they are the most common, this review will focus on K-frame revolvers with a 4-inch barrel. Picking out the right holster for your K-frame can be tricky. It’s worth considering what you will be using it for. Are you a huntsman or a competition shooter? Or do you just want a good holster for the daily slog? 1) It should have some form of retention – a good test of that is to tip your holster upside down and see if it holds on to your gun. 2) It should also be comfortable enough to wear. Time and again, I’ve bought a holster, lulled by some aspect of its design, only to discover I can’t use it without experiencing intolerable pain. 3) The best holsters last for years. A good holster should be durable. This will depend largely on the materials it is made from, but the manufacturing quality and how well you take care of your holster are also important. Appendix Carry: This is a carry position at the front of the body at about 1 or 2 o’clock. Cant: The angle at which a gun is held upright in a holster. Carry Position: The position you place your gun on your body. Designated by hours of the clock – 12 o’clock being the bellybutton. Crossdraw: When you use your strong hand to draw from the weak side of your body. Open Top: This is a holster without any retention strap to hold the gun in place. Pancake Holster: A holster made of two pieces of material sown together. Retention Screw: This is a built-in screw that adjusts how tightly a holster holds a gun. Ride: How high or low a holster sits on the belt. SOB: This designates a holster than can be place at the small of the back, at the-center (or just off-center) of the back. Strong Side: The side of your body closest to your shooting hand. Thumb Break: A strap that retains the weapon, usually released with a snap or button. Weak side: The side of your body furthest from your shooting hand (also called the support side). Also known as an OWB (outside-the-waistband) holster. Typically, these are the most common kind of holster for a K-frame revolver with a longer barrel. A lot of belt holsters are worn on the hip on either the weak or the strong side. This type of holster arguably provides the fastest draw. Inside-the-waistband holsters are worn inside the waistline of pants and close to the body. This is probably the most common form of concealed carry. Not really suitable for a K-frame with a larger barrel, but definitely an option for snub-nosed revolvers. Now a popular choice for smaller-sized weapons, these holsters allow you to place a holster in your pocket. They usually have padding for comfort. By and large, pocket holsters feature an open top, and have a tacky exterior to allow for an easier draw. Again, this will work with a snubby; not really worth considering for anything larger. Another form of carry that’s been around for a while. This method of carry is designed for cross-drawing. 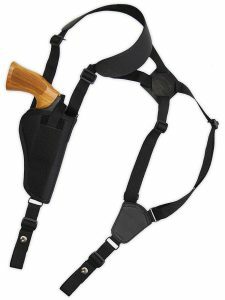 Shoulder holsters provide a different option for carrying a heavier weapon. Particularly useful if carrying on the waist isn’t suitable. This lightweight holster is designed to be worn on the hip. It’s custom built to suit a number of firearm models, and features an injection molded belt loop that fits belts up to 1.75-inch thick. It’s available for both 4-inch and 6-inch K-frames, and is also available for left-hand and right-hand use. It features an adjustable front strap which fits securely over the hammer. Its durable design make it perfect for use as a field holster, or for hunting and camping trips. The 10 degree FBI-standard forward cant helps with carry comfort and ease of draw. The front strap secures to a piece of Velcro inside the belt loop making for a bit of a tight fit when combined with a belt. Not everyone is into wearing their gun on their belt; it may simply be inconvenient. If that’s you, you could try a shoulder holster. This is a traditional leather shoulder holster. The quality really shows in areas like the precision stitching. It also has a suede leather shoulder pad which prevents the harness from moving about on your body. It’s a lightweight holster – weighing in at 8 oz. It has an adjustable retention strap and thumb break to keep your weapon secure. The harness is completely adjustable depending on your height. This holster may not be the best fit for a particularly large or small person. This is another belt holster that is made from quality grain leather. It is able to accommodate up to a 2 1/4-inch belt. It’s available for both the left and right-handed, so don’t go and order the wrong one! 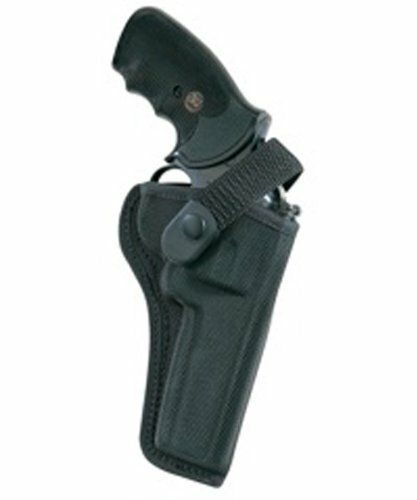 This holster features a spring-stiffened safety strap with a thumb break for secure carrying. It has a closed-bottom design to protect the barrel crown of your firearm. This is a molded holster that fits snug against the body. This holster leaves the trigger exposed. It’s a bit of a tight fit upon first purchasing. Not exactly a negative as the leather will become looser with age and become a perfect fit. This is another leather belt holster with a classic, old-timey feel to it. 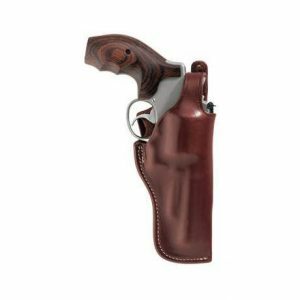 Make sure you get the “size 2” version of this holster, which is suitable for a K-frame revolver with a 4-inch barrel. Also, remember to order the correct right or left hand orientation. This is a heavy-duty holster made from thick leather and with strong stitching. It has a thumb break for additional retention. It can be worn either strong side or cross draw depending upon your preference. It is a bit pricey, but well worth it, seeing as it should last you for years. Not really a disadvantage, but some people complain about the leather being very tight upon getting the product brand new. As with any leather holster, it will need a good bit of wearing in. If you’re looking for a good quality holster for your S&W K-frame, there are a nice selection available to choose from. The holsters above are the top of the pick out all of the holster we’ve tested, and will all work well with a K-frame revolver. However, the best of these remains the Bianchi 7000 Black Sporting Holster. This holster is custom molded for your gun model, which means you already have an excellent level of retention. Retention is then improved upon by the front strap. It’s also made from sturdy materials that can endure harsh conditions – making it a good option for both excursions into the outdoors and casual carry. Enjoyed the article about all the K frame holsters. Unfortunately I own a S&W model 15-3 k frame snubby. Even top leather fitted holsters do not solve the problem of a top heavy k frame snubby resulting in a holster that flops back and forth against the body probably due to the design that rides high on the belt. Your review which mentions a snubby, failed to produce one holster example for this piece and did not address the common knowledge about the top heavy combat masterpiece. They did say they were focusing on holsters for the 4-inch guns at the beginning. the new m19 sw classic is 4 1/4 barrel and some of the 4 in holster do not fit. I know because I have one for a python that doesn’t fit. Which ones will.